When Art Impressions sent me a package of stamps from their latest releases – this had to be the first one inked up. That pig! LOL! Love that he’s a little yellow bee! 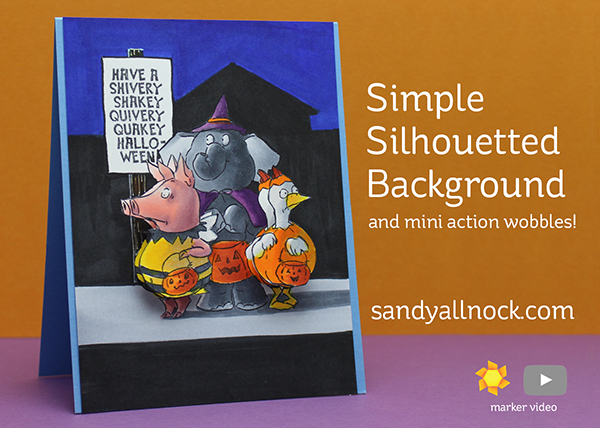 Silhouetted Background – and mini action wobbles! This is one of those grouped stamps that doesn’t need to be masked – the three little images are all in one stamp. The “wobbly” sections – torsos and heads of the pig and duck – are separate stamps, and there are matching dies to go with them! I’ve been wanting to make a card with a really really simple background that everyone can handle – and this complex image seemed a good time to do it. Watch the video below or click HERE to see it in HD on YouTube! Such a fun card. Love those wobbly critters! I like the mini wobbles and your card is excellent. Great card! I just love AI’s stamps and making them wobble! Super fun! wow! 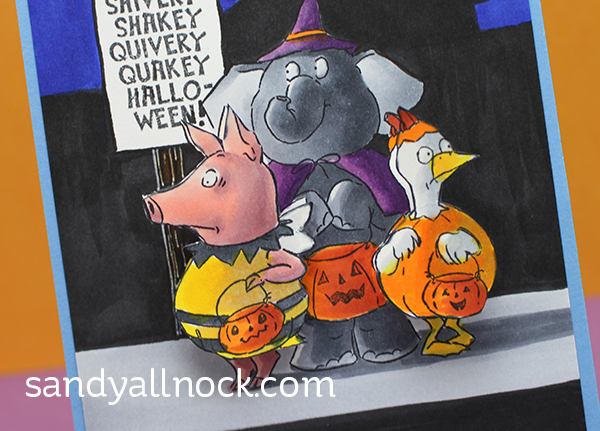 another spooktacular card! I am so glad you tell us what stamp sets you use. You are an amazing artist! thank you Sandy for your wonderful creations. Thank you for this series. (Other than your new pups…) It is hard to pick a favorite. Very cool! thanks for showing how you did it! Whew – an easy background. Even so simple “I” can do-LOL. TY for all the little tips while coloring. The Art Impressions stamps always make me smile. Thanks for sharing your take on this adorable stamp! LOL. This IS way too cute Sandy and yes, I love the easy background! I do believe even I could do this!